Who is George of TDM 1874 Brewery? TDM 1874 is nested in Tokaichiba, Yokohama and is new to the family of craft breweries since January of 2017. A spectacle façade with glass and brick, glistening 400L to 800L steel and copper tanks in the backdrop to show case a welcoming feeling and experience. Don’t be inclined to think “new” mean inexperience, TDM 1874 is owned by Sakaguchiya and has been operating since 1874. Sakaguchiya has dealt with wine and sake with their shops in Kannai and Aoyama (Marche Dix Jours’) while offering their delights to the Yokohama area and parts of Tokyo. TDM stands for Ten Days Market which is a direct translation from Tokaichiba and they are truly a brewery for their community. The head brewer goes by George at TDM 1874 and we have to thank his mother for the tasty treats he brews up. 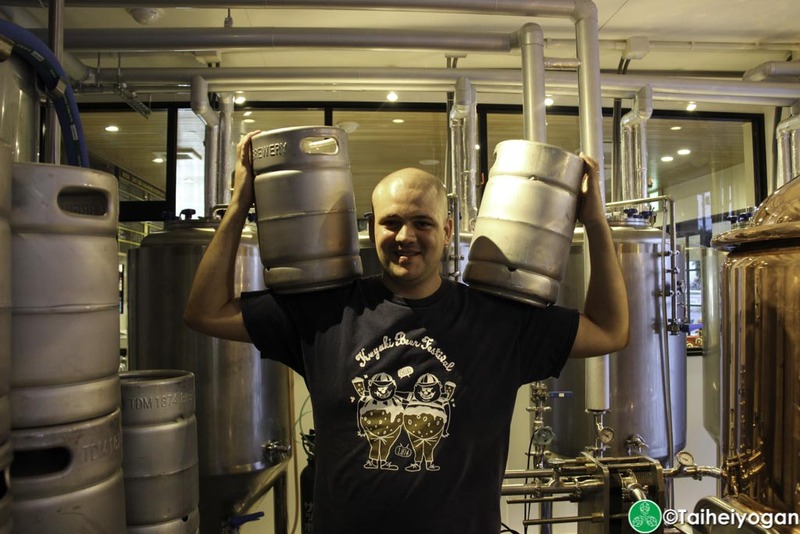 “My background is I started home brewing at age 13. My mum started me off making elderflower champagne and I got really interested in the hobby, moving onto beer and full grain mashing later on. I went to university of Brighton and didn’t really enjoy my time – Brighton is an expensive city and I always seemed to find myself broke. However, I was home brewing lots with a friend to keep myself in beer. I used to go to the local pub and give beers to staff to try. One day I managed to give my beer to one of the brewers at local brewery Dark Star Brewing and was offered a job the next day. I left university and started working at Dark Star age 19. I worked there for 4 and a half years working my way up to being second brewer as well as having roles in production management. Taihei: When did you start to work for Hitachino Nest? George: I moved to Japan in 2011 and worked at Kiuchi Shuzo (Hitachino Nest) for a year, which was a difficult year for me after having a good job in the UK and being stuck at the bottom of the ladder again doing a factory job. We also got hit fairly hard by the Tohoku earthquake in Ibaraki, which made the year there more challenging on a personal level. Taihei: How long were you in Brimmer Brewing and how did you get Scott Brimmer’s attention to hire you (the classic, my resume is in this bottle)? George: Scott Brimmer and I had been friends since the second time I visited Japan. A beer industry friend of mine put me in contact with him and I ended up staying for a few days in Shizuoka with him. At the time Scott was at Gotemba Kogen Brewery and we went to a few breweries in the area. He introduced me to Bayern Meister Brewery, which is still one of my favourite breweries in Japan. When I was getting ready to leave Kiuchi, Brimmer Brewing was putting the final stages into making their brewery and they decided to take me on. I stayed there for a year during the start-up and loved my time there, though there wasn’t enough work for two experienced brewers to do at the time, and I left at the end of 2012. It’s been great to see their business grow and now they are always busy, as well they recently expanded their tank space and are killing it. Gimme Brimmer Brewing Porter any day; I have a crazy love affair with that beer! Taihei: What was in that bottle that you gave to the brewer at Dark Star Brewing? Have you made it at TDM 1874 yet? If not, what would you call it? George: You know I actually can’t remember… I was home brewing lots 11 years ago and it might not have been just the one beer. So I’ve no idea what I’d call it. Taihei: How did you land the head brewer’s position at TDM 1874? George: In 2016 my friend Todd Stevens from Beer Cats put me in touch with Kato shacho (President) from Sakaguchiya (Todd had worked with my Shacho’s (Kato) daughter in his previous job and whilst building the brewery, he reached out to Todd asking if he knew any brewers looking for work) and I took the Job at TDM 1874 Brewery. TDM has been a great opportunity as I’m allowed freedom with my beer (within reason, our main customers are new to beer and I brew with that in mind – we haven’t yet really catered to the beer geek crowd, though I plan to make beers that will appeal to them soon) as well as given me the chance to learn about wine also – which I found a deep love for since starting at the company, it really helps to be around people who can guide you through something you are completely new to! Taihei: After being on a three and half year’s hiatus of saying, “this is a pen”, how did you feel on your first day? George: I was a little nervous, though the first few weeks weren’t too busy. It was definitely a completely different company than I had worked in before. The language barrier was tough, although I knew a fair amount of Japanese before, I had become really rusty from teaching and only speaking English. I had 5 weeks of holiday in between jobs and it really felt good to be back, especially with the prospect of what was gonna start in the months to come. Taihei: What was the first beer you produced at TDM? George: The first beer was the Pale Ale. It came out far stronger than I wanted but it wasn’t so bad. It’s definitely cleaner and more refined now. Taihei: Do you continue to adjust your beer recipes to make them better? George: I did, yes. We are at a point now where the main lineup is unlikely to change recipe wise. It’s a difficult task for brewers to get used to how their equipment works and adjust the beers to reach the goal. Taihei: You said, “brewing in reason for your main customer”, do you think it’s a lack of knowledge that Japanese are not accustom to the non-standards like sours, stout, wheats and so on? George: It is probably more because they haven’t been exposed to the styles. That happens even in the UK where we have a long history of brewing tradition also, but in Japan even more so – people are first exposed to Asahi, Kirin, etc., who traditionally have a main lineup that doesn’t include much other than lagers. As for sours, it’s not really all that appealing to most people – there’s very few Japanese dishes that are sour or spicy and that kinda rolls over into the beers people drink. Of course there’s a small niche of people who love sours, but not to the extent we see in the USA and Belgium. Taihei: Which Japanese brewery do you have the most respect for and why? Yorocco Beer: Because his beers are amazing and I love his core principles around brewing. Beers are always soft and unique. Devil Craft: Because their beers are amazing and I love how they are always studying up and trying new things. Their beers are usually more impactful. Taihei: Has the Japanese craft beer market become saturated? George: No, although it perhaps might do so soon. I predict that we will see a bunch of breweries open up without the experience or knowledge of brewing because they saw craft beer growth and thought ‘why not? !’ – which worries me a bit. Also the amount of new craft beer bars opening seems to be slowing down a lot, so there may be some breweries getting competitive over tap space. There’s still a lot of space in the Japanese market for good domestic beer. Taihei: Let’s change gears here. Are you a fan of the Ramen? It’s not common to drink beer with ramen, but what would you pair it up with? George: Yeah I like ramen. I pair it with water. There is enough going on with ramen that really I just need the water to battle the salt. Taihei: You told me that Dark Star was doing cask beer. For those of us that lack beer education, how is the process different from bottling and kegging beer? George: Cask beer goes under secondary fermentation in the barrel, which means it has a softer carbonation. It’s a completely different approach from keg as you need to take recipe formulation into account as you can’t rely on the extra CO2 to make the beer seem dryer etc. Sadly there’s not much cask beer in Japan (although Baird do a good job with their cask beers). The problem with cask is that it is allows air to get to the beer (oxygen being the mortal enemy of beer) and it spoils within a few days. Keg however you can use CO2 or Nitrogen gas to push the beer out, which won’t spoil the beer like oxygen does. As much as I would love to do cask beer, it needs to be sold in a few days once the cask is tapped – which is difficult for the Japanese market. Taihei: When will you offer an elderflower beer for Mother’s Day? What would you name it? George: We do an elderflower beer, though it is just for summer, so not on at the same time as Mother’s Day. Taihei: What styles do you brew up? George: We brew a variety of styles from different countries – though often I get pigeon holed for brewing British styles being from England and all. Usually tend to lean towards using English malts (though sometimes German) but I love using American hops. 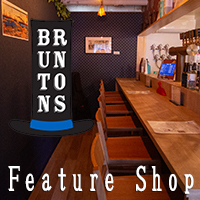 Year round beers are: British Best Bitter (BBB), Pale Ale, Hamanashi Gose (made with hamanashi pears that are picked close to the brewery) and IPA – which is currently on a number system i.e. IPA #4. This is to allow me to play around with different and new hops as well as to give customers a wide view of different IPAs – sadly in Japan everyone expects west coast/Californian style IPAs, but of course the style is far broader than that. Taihei: A few weeks ago, I saw a salaryman drinking a tall boy of Super Dull on the train at 10am, when do you think we will see the same guy with a craft beer at 9am? George: There’s probably someone drinking craft beer at 9am. It’s 5pm somewhere! Taihei: If you could open your own brewery today, what would you name it? I would personally name mine Beery Mcbeerface with the member from ZZ Top with no beard as my logo. George: Planned on ‘Ibuki’ as it’s Japanese for Juniper – but then someone named a hop Ibuki and it lost its appeal a little. George: If I had a blank cheque – I’d choose Rolec! They are the Rolls Royce of brewing systems. Taihei: What was the biggest eye opener when you went from home brewing to commercial brewing? George: I guess how dangerous and unglamorous brewing really is. Home brewing you are just worried about not having boil overs or dropping stuff on your feet. In pro breweries it is really really easy to get hurt, ever if you take precautions. Cleaning chemicals can be extremely dangerous and there are often lots of hot water and pipes that can cause burns. People have this image that pro brewing is really glamourous and you get paid to drink all day, which is very far from the truth. It’s hard work, but it is what I love doing. Taihei: You have used many different types of system and fermentation tanks, noticed any differences between using them (besides it takes longer to clean those bad boys)? George: I have used quite a few systems. Starting at Dark Star Brewery, the old factory was a UK 15BBL (about 2400 Litres) and the second factory was UK 45BBL (about 7300 Litres). Cleaning usually takes the same amount of time for big or small tanks. At Hitachino Nest there were a few different brew houses, though I only used the 1000 Litres one – which is the same size as the system was at Brimmer Brewing. The main differences being process, some systems are a lot easier than others to use and some have you running around opening valves manually. I really loved using the 45 BBL at Dark Star Brewery; such a huge amount of beer made in one time! TDM 1874 Brewery is the smallest system I have worked on at just 400 Litres. It has its own challenges, but the brew house is very easy to use. Taihei: Was your first home brew any good? Any horror stories you want to share? George: It was pretty decent! I never really had any real horror stories, but I did have a few bottles of wine pop their corks, or being woken in the night by the lid exploding off a brewing bucket – nothing more than a shock. Taihei: What crazy ingredient would you love to try adding to a brew? George: I dunno… everything that should be added in beer has been done. Experimentation is good, but the saying ‘just because you can, doesn’t mean you should’ is a personal rule I brew by. I’ve brewed with all kinds of things, fruit, chillies, flowers, wood, paradise seeds… I usually get inspiration for new beers every now and then, which changes seasonally. Taihei: Last question, the fun question. If your beers were British comedians, who would each of them be? George: I guess a few would be Sean Lock – dry, with bite and make everything feel a bit surreal. This entry was posted in All Regions, Interviews and tagged George, George Juniper, Interview, TDM 1874, TDM 1874 Brewery. Bookmark the permalink.